Ali Block lies opposite to Hub Commercial and Usman Block. Nearby blocks are Phase 8 D block, Phase 8 C Block, D-Extension Block and Lake View Block. This block has 5 and 7 marla residential plots and a few commercial plots opposite to the Bahria Town Head Office. 7 marla residential plots lie towards the hub commercial area having access from Ali Haider Avenue, whereas 5 marla residential plots lie towards Usman Block having access from Usman Ghani Avenue. 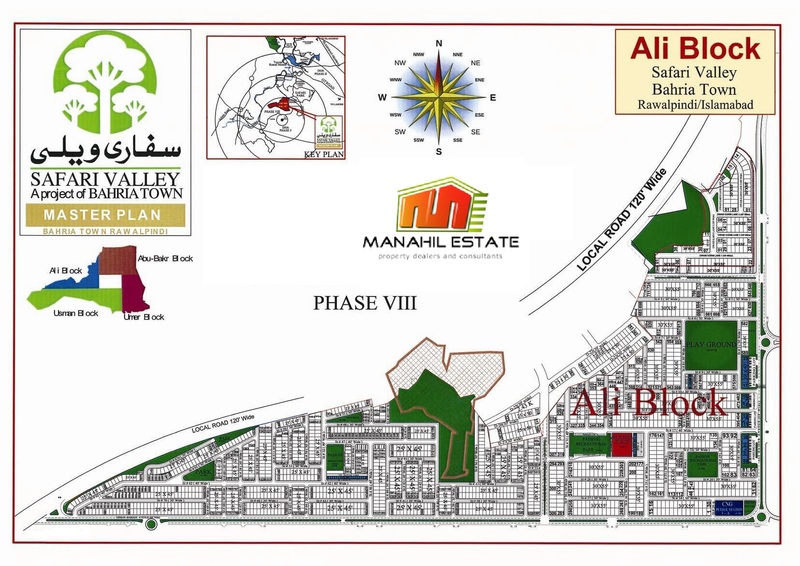 7 marla plot prices in Ali block are almost equal to those in Usman and Umer blocks, however 5 marla plot prices are a bit lower than those in Rafi block. Cheapest area in Ali block is close to the village which lies between Ali block and Phase 8 D block. The village consists of few houses which are not under control of Bahria Town, therefore plots surrounding the village cost cheaper. Average prices of 5 marla residential plots in Ali block range from 22 lacs up to 30+ lacs depending on location and category, and 7 marla plot prices range from 30 lacs up to 40+ lacs depending on location and category. Despite the fact that Ali block is not much populated, it is undoubtedly one of the best blocks of Safari Valley as it will be closer to the most populated areas of Phase 8 and bahria expressway. Also it is quite affordable for those who want to build house with low budget. You can get 5 marla plot for as low as 22 lac rupees and spend around 30 to 35 lacs on construction to get your new house ready. If you need further information regarding Ali block, feel free to contact us for consultancy.